AT THIS TIME...THE AREA AT GREATEST RISK OF LONG-TRACKED TORNADIC SUPERCELLS WILL BE OVER WESTERN OKLAHOMA AND SOUTH-CENTRAL KANSAS. STATE AND LOCAL EMERGENCY MANAGERS ARE MONITORING THIS POTENTIALLY VERY DANGEROUS SITUATION. THOSE IN THE THREATENED AREA ARE URGED TO REVIEW SEVERE WEATHER SAFETY RULES AND TO LISTEN TO RADIO...TELEVISION...AND NOAA WEATHER RADIO FOR POSSIBLE WATCHES...WARNINGS...AND STATEMENTS LATER TODAY. 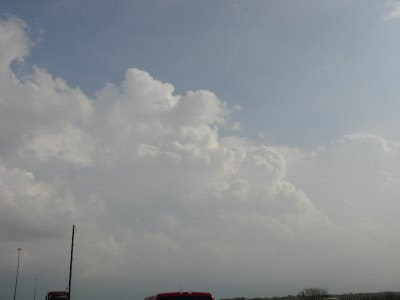 Started seeing Storms initiate about 4:30. Decided to run like hell to Wellington. If we were lucky, we'd make it on the back side of the storm. 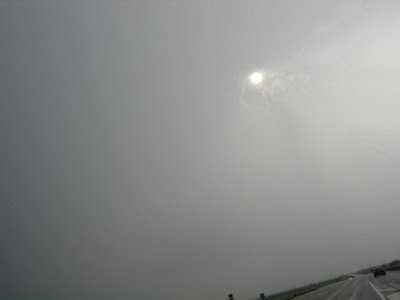 It was very overcast and there was a lot of precipitation falling around so once we were under the storm, we had some difficulty deciding where to go. We hit Wellington and then decided to head East into Winfield. We waiting a while in Winfield hoping the storm would figure out what it wanted to do. Off to the west I could see a "beaver tail" (an area where warm moist air feeds into a storm and gives it a lot of intensity) build. Another thing that caught my attention was the nice clear slot that had developed next to it. 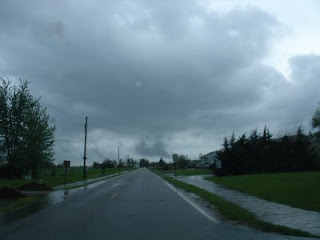 We had our wall cloud. 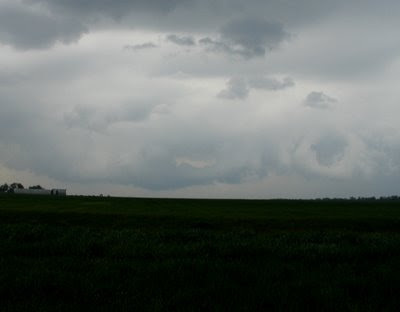 Couldn't tell what the cloud in the center was trying to do, I don't believe it was a funnel. The wall clouds of this storm didn't survive. 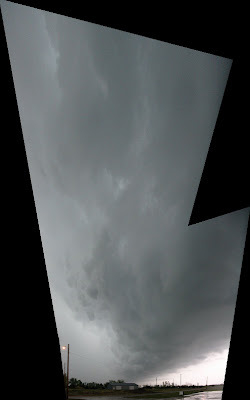 The storm seemed like it was attempting to organize but fell short. 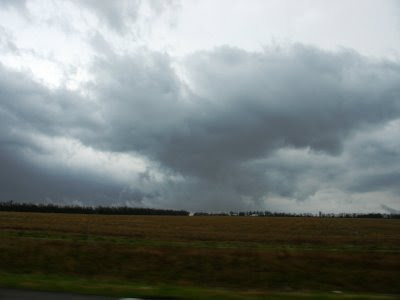 The wall cloud above did cause the warning for Sumner Co. The wall clouds continued to generate and created a few odd clouds like the "O" cloud. 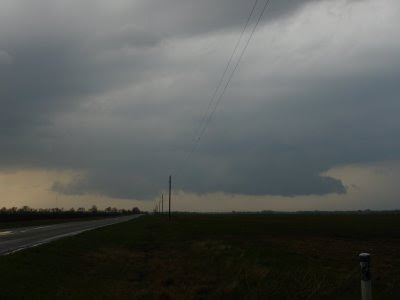 We followed up to Oxford, where the radio was claiming the wall cloud was overhead. It didn't last too long either. We watched as the cloud tried to rebuild and hopscotched to the East. With the sun going down, we decided to call it off. We found Udall road and headed back. 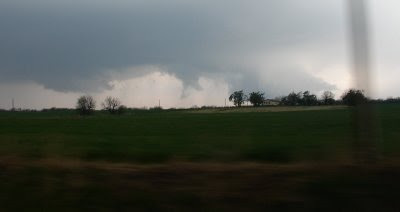 This storm went on to cause a brief tornado in or near the town of Douglass. At this time no one was reported hurt and it was limited damage. Keep your eyes to the sky tomorrow. Round two is less than 16 hours away. They are predicting a major outbreak tomorrow. Be prepared. More pics of this storm, forthcoming. Looks like the threat of severe weather may last all weekend up to Monday. 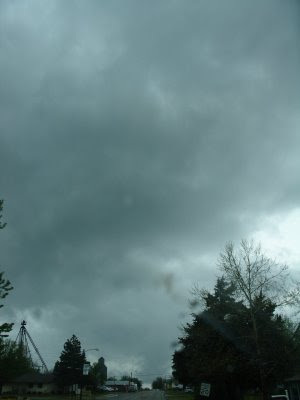 There is a threat of tornados which could occur after dark tonight. Although most of that has gone more to the SouthWest. Another scary thought is with the amount of moisture in the air, they may be heavy precipitation storms with rain wrapped tornados. Today might be good, Tomorrow may be great. Wichita had a nice soaking overnight, but a nice day otherwise. 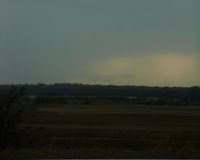 The guys at http://www.tornadovideos.net/ intercepted the twin tornadoes north of Dodge City. Per the National Weather Service, there were no injuries or fatalities, but a house was destroyed. I took this before the storm hit here in Wichita, it had a strong wind, heavy rain, but we did without the hail. Good chance for hail today late afternoon into early evening. Top wind gust today 55mph.